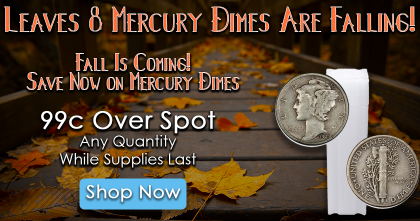 Blog - End Of Summer Sale On Mercury Dimes! It's been a long and interesting summer in the precious metals world. Metals prices have spiked higher, North Korea is overstepping on the world stage almost every week, and the U.S. dollar hit a 15 month low. While many things change, one thing has stayed the same: specifically our industry-low premiums on silver Mercury Dimes! 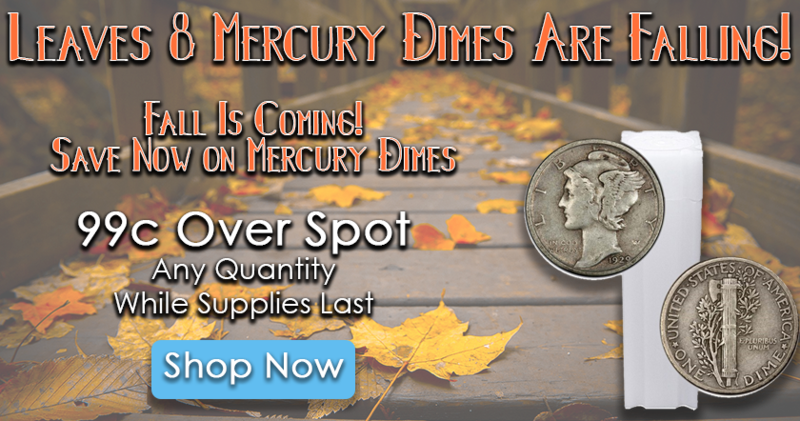 We began the summer with a special price on Mercury Dimes, and we are bringing it back to close out the summer! For a limited time, Monument Metals is offering Mercury Dimes at only .99c over spot for any quantity! Not only is Monument Metals the only major online retailer that will sell you 90% "junk" silver in $1 Face Value increments by type, we have the best deals on Mercury Dime tubes and Mercury Dime bags as well! Mercury Dimes have always been one of the most, if not the most, in demand denomination of 90% U.S. "junk" silver. Typically, these coins trade at a substantial premium over spot, and even a significant premium beyond their more common 90% counterparts such as Roosevelt Dimes or Washington Quarters. Mercury Dimes were produced from 1916-1947 and are considered one of the most beautiful coin designs in U.S. history. They much harder to find in quantity (and decent condition) than the Roosevelt Dimes that came later. Mercury Dimes, despite being priced like bullion, have true numismatic appeal. Having vanished from circulation over half a century ago, they've developed a tremendous collector following! This is a great way of owning a hybrid bullion/numismatic item. 1. The stars are aligning for a strong precious metals market this fall. - With continued uncertainty in Washington D.C. and North Korea, investors in major markets are becoming nervous and have already begun seeking precious metals as a safe haven investment. We suspect that this activity might increase further as we approach another debt ceiling increase. Coupled with the lowest U.S. Dollar Index levels in the last 15 months and traditionally strong seasonal buying overseas, this could be a very good fall season for precious metals prices. 2. Availability is limited. - Like all 90% silver coins, Mercury Dimes have a finite supply. When demand for silver heats up, these become extremely difficult to find. The result: premiums often increase dramatically. Two years ago, I remember trading these for $5.00-$6.00 per ounce wholesale! By contrast, we've been stockpiling Mercury Dimes at today's absurdly low premiums. This is why we can offer them to you for just over melt. 3. Premiums are nearing all-time lows. - Because the summer was so quiet, Mercury Dime premiums have dropped. As we transition into fall, demand will increase (and we have started to see this already) but if you act now, you can still grab summer-style premiums before the big push of fall demand hits. This late-summer environment has created the perfect opportunity to save money on silver Mercury Dimes. These coins can regularly demand a premium of almost 40%-50% over spot and other online dealers haven't reduced their prices at all! At Monument Metals, we give our clients a discount when there is one to be had. We are offering 90% "junk" silver Mercury Dimes at the lowest prices online and we will match the price from any major online retailer you find that is better (although we doubt you will find anything better). Be the best savvy coin buyer you can be. Take advantage of this opportunity while supplies last.